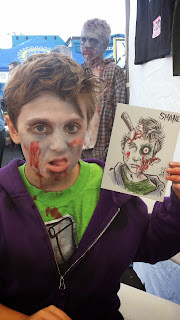 THE BRILLUSTRATOR: Zombies of Normandy Park! 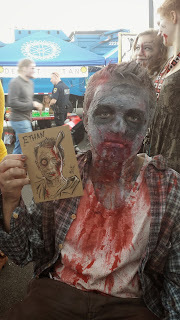 Last Saturday, I was asked by my friend and fellow Cartoonist's League of Absurd Washingtonians member, Mark Monlux, if I wanted to go to a small Zombiefest event taking place in the parking lot of a shopping center in Normandy Park (a small city here in Washington.) 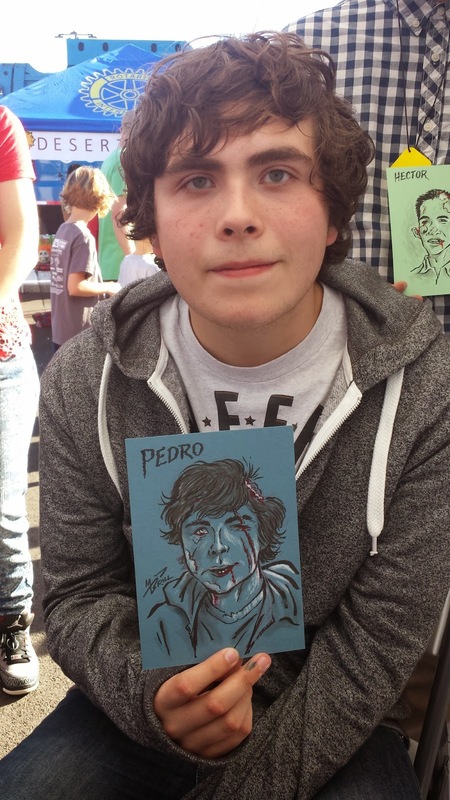 I could set up a little table under his portable tent next to his table where he'd be selling his merch and I could sell stuff or do sketches for people. So I said, "Sounds great!" The next day I would be attending the last day of RainFurrest, so I was hoping to raise a bit of cash to pay for my one day membership, an artist's alley table and maybe even parking. 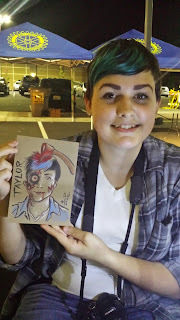 Zombiefest took place between 4:00pm and 8:00pm, so I did all my little errands and got my art bag together during the morning and at 2:00 Mark was at my door to pick me up for the 50 minute trip from Tacoma to Normandy Park. We got there and set up his portable tent and got our items out on display--I only brought a few of my little Brillustrator Sketchbooks and two little zombie drawings done on matte board tiles with ink and a bit of color pencil for high-lights. I put them on an easel and started making a sign announcing that I would do monster sketches for $10. I brought a bunch of 5'x7' card stock pieces of different colors on which to do the little ink and pencil drawings, similar to the zombie drawings I had on display. I figured I would get a few takers. 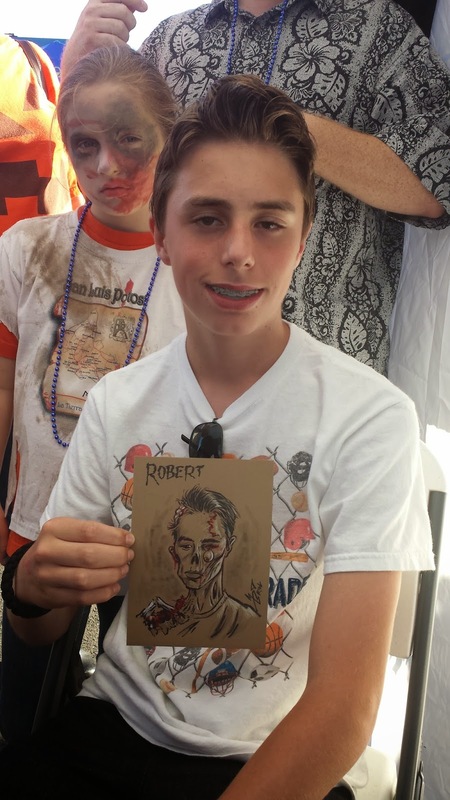 Before I had finished my sign, I had two teens who wanted sketches of themselves as zombies, and I thought, "Oh good--that cover's my artist's alley table at RF!" 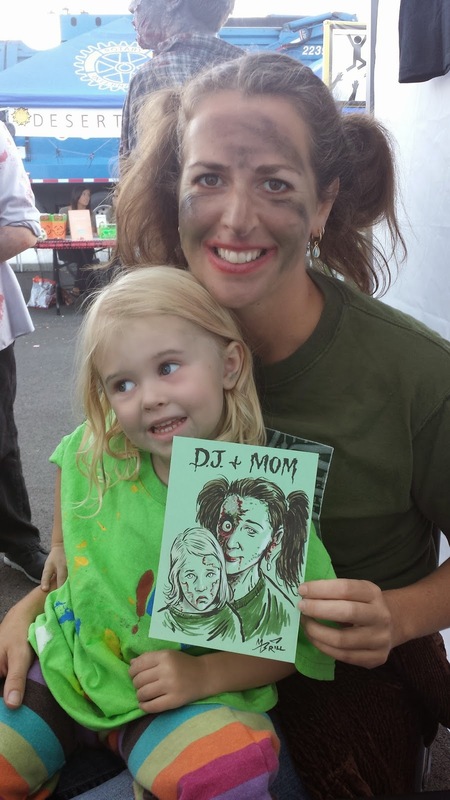 So I worked on getting those drawings done making good use of my beloved Pentel brush pen. By the time I got done with the first one, I had a line! And it NEVER let up! 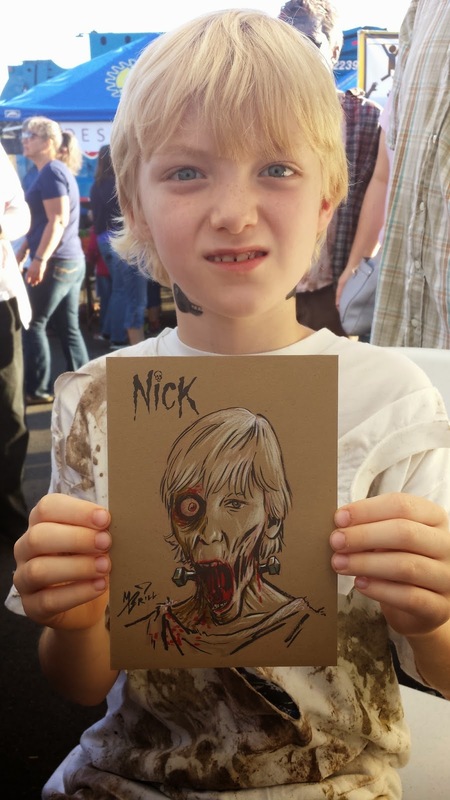 For the next four and a half hours, I did 16 zombiefied portraits of the good citizens of Normandy Park, about half were kids. The more messed up I made them, the better they liked it. I never took a bathroom break, or even stood up from my chair until Monlux was ready to pack up the tent around me! At about 7:00 it started getting dark, so that the last 4 or 5 drawings were done in progressively deepening gloom--to the point where it became hard to see what I was doing!